Utilising our own in-house body building workshops, Maun Motors can now install fall-arrest systems to our fleet of crane lorries, dropside and flatbed trucks, to help customers meet their health and safety commitments. Upon request by an account customer, this safety equipment can be retro-fitted to an existing hire vehicle, or a new vehicle can be built to specification for a long-term rental contract. 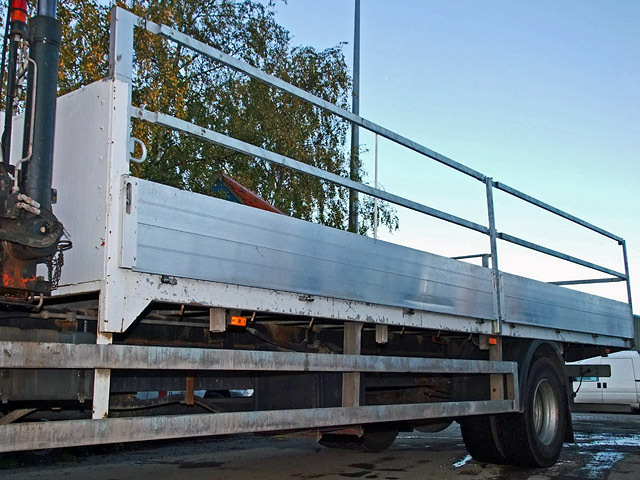 According to the Health and Safety Executive, "Falls from vehicles are among the most common accidents involving workplace transport. 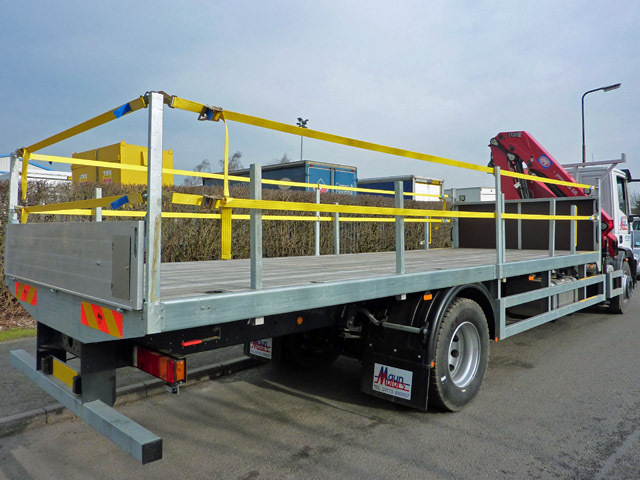 ", so more and more companies are looking to incorporate installation of fall prevention systems to their commercial vehicle fleet, including the rental and contract hire vehicles they operate. The two fall-arrest system designs we have produced so far incorporate different materials to suit individual customer requirements. 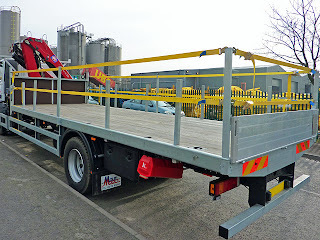 The first design features galvanised steel box section rails, which surround both sides anjd the rear of the load area. The body pillars are extended and the bars attach to these by means of anti-luce fasteners. This makes the ant-fall rails easy and quick to remove when access to the load area is required, but ensures a very robust fall prevention system. 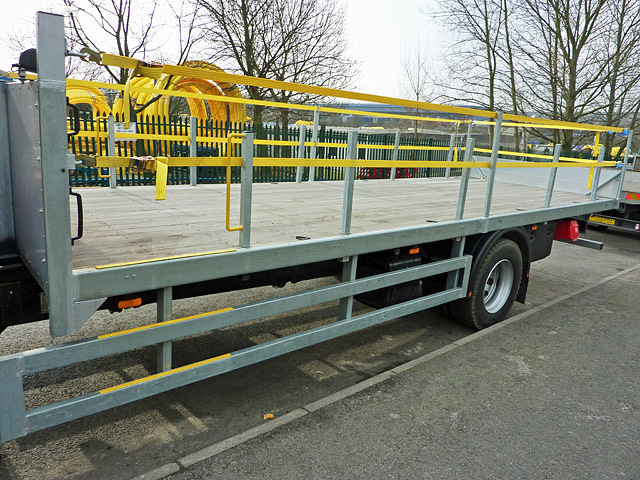 Our design also incorporates a drop-down access ladder to allow operator access to the load area when required. 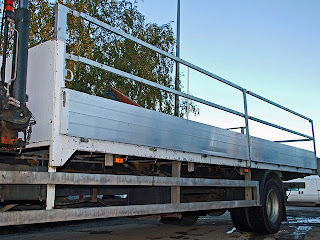 The downsides to this steel construction are additional weight (i.e. 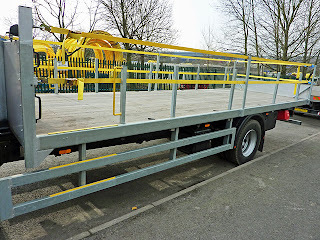 reduced payload) and, should any damage occur to the anti-fall rails, the replacement cost of manufacturing a new bespoke rail to fit. 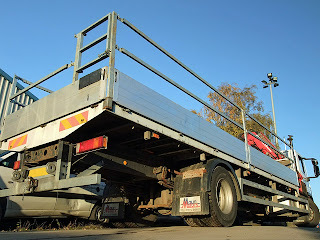 The second configuration of system to prevent falls from vehicles incorporates nylon webbing tension straps, which again protect from falls over both sides and the rear of the vehicle. 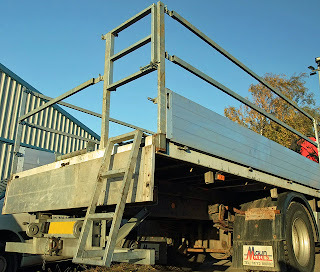 Extended rear and centre pillars ensure that the straps remain in place and the tension of the straps can be controlled by the operator by means of a ratchet tensioning mechanism. 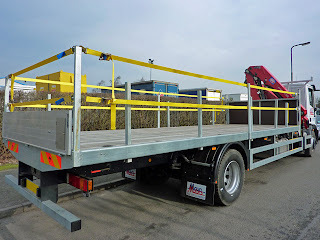 These straps are much more lightweight than the steel rail design and are designed to withstand regular use. However, it is recommended that the ratchet and hook end-attachments are regularly lubricated and due to their construction the webbing straps can de prone to chaffing and cutting from cargo with sharp edges. These straps are very economical, quick and easy to replace, should one become damaged. 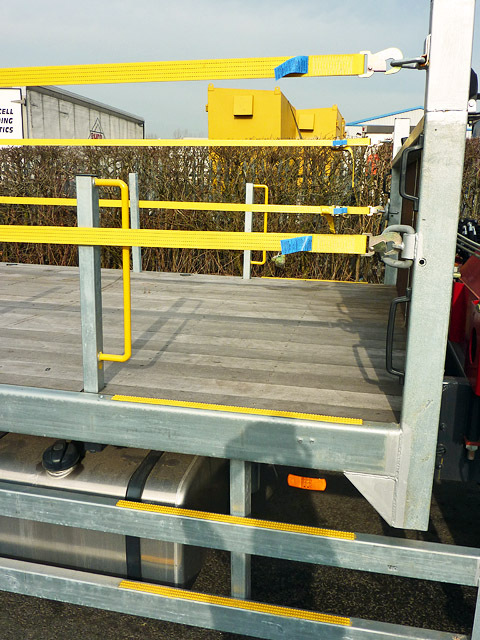 To assist the operator/driver to access the load bed, removable grab-handles are located at access points and painted high-visibility yellow for ease of location. 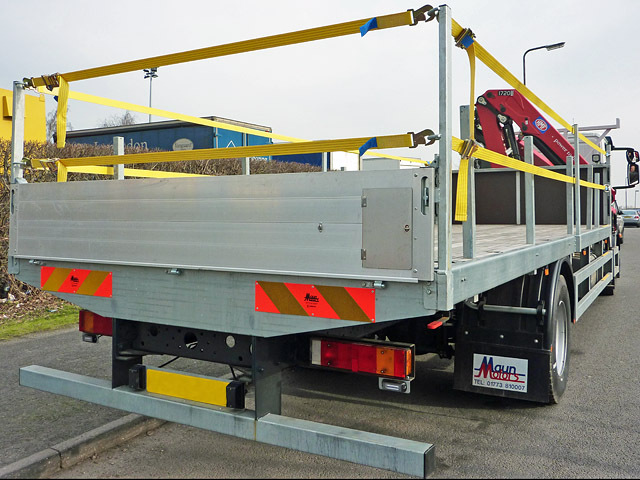 Also, non-slip sections are fitted to the body side guards and side rave (again, painted in high-vis yellow) at all load area access points. 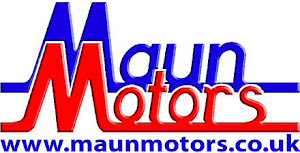 If your company has requirements for renting a crane lorry, dropside or flatbed with a fall-prevention system fitted, then please call Maun Motors direct on 01773 810007 to discuss your requirements. For further reading regarding the prevention of falls from vehicles, please visit the HSE website or download their online leaflet entitled Preventing Falls from Vehicles - Advice for workers.